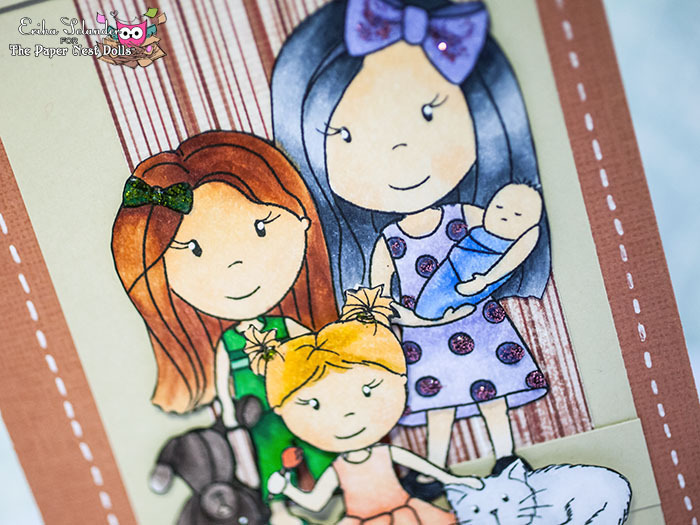 Today I wanted to show you a new card that I have made using one of the digital stamps called The Dolls. It is a great image that can be used for almost any type of card. I printed the image on white cardstock and started coloring it with my Copic Markers. I didn’t really know what kind of papers I was going to use for the card so I didn’t have any particular color scheme in mind then coloring. When I was done coloring I cut the image out with my scissor and started thinking about how to make the card. I used a reddish cadstock for my base and then an old paper from what I think might be My Minds Eye. I made a simple backgrund for the image and placed it onto the card base. I realized that the image would be to big for the card so I cut it apart and placed one of the girls in front of the others instead of to the side. I used foam squares to make her stand out a little more. 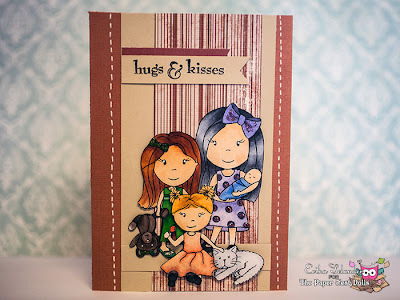 For the sentiment I just cut a strip of patterned paper and cardstock and stamped a greeting. Feel free to visit my personal blog for more cards made by me.